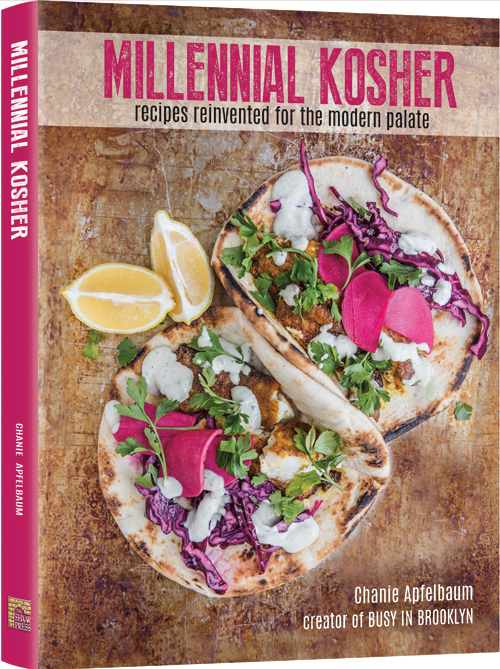 Millennial Kosher is the debut cookbook from popular Kosher food blogger, Chanie Apfelbaum of “Busy in Brooklyn”. It is unlike any other Kosher cookbook I have come across. In fact, if it didn’t have the word Kosher in the title, I seriously would not even guess it was. “Millennial” is described as someone who is reaching young adulthood in the early 21st century. The table of contents gives you quite array of choices from staples, breakfast & brunch, appetizers, salads & spreads, soups, fish, poultry, meat, meatless meals, dairy, sides, cakes pies & tarts, sweet treats and savory snacks. Chanie also explains “How to Cook Millennial Kosher” – which include things like “spice things up”, “find the right balance” and “track the trends” which are just a few of the ways to adopt this way of cooking. While this seemed to be geared for the home, kosher cook; I believe this truly can be applied to anyone – millennial or not. As a trained culinary professional myself, I can truly appreciate that she also included a section on tools and equipment. Recipes are great; but without the proper equipment, it won’t always turn out the way you’d like. I think Chanie gives a nice mix of basics along with a few extras that can help your food really stand out. She also gives a list of the basic ingredients she likes to keep on hand, and it includes some classics as well as some interesting ingredients that can add the “umami” (one of the 5 tastes; savory, typically related to how your taste buds respond to glutamate. Think of soy sauce, mushrooms, even tomatoes!) element as well as elevate your weeknight meal. Another huge standout that everyone will appreciate is a “Guide to Kosher Meat Cookery” She goes into detail on the different fabricated cuts, cooking methods and why it’s important to know what type of meat will help you achieve proper cooking. She has another version of this on her blog. The book is absolutely stunning and is truly inspiring to me personally. I watched Chanie throughout the entire process on her instagram stories. From the announcing, to collecting props and converting her dining room into a photography studio. It officially changed my mind about writing a cookbook one day! To see its culmination into this beautiful hard covered book, is just amazing! Bucket list baby! The photography is one of the best I have seen from a blogger who photographed her own book. They jump off the page! They tell a story. (she even included some of her late bubby’s recipe cards and kitchen equipment) the photography is colorful and imaginative. Some of my favorite recipes include: Spinach Pistachio Pesto, Ramen Shakshuka, Green Eggs & Latke, Tamarind Chicken Wings, Everything Bagel Tuna Patties, Pineapple Rotisserie Chicken, Lazy Mechshie Mattballs, Sticky Silan Shortribs, Date Peanut Chews...okay, I can keep going, but I won’t! You must buy this book because it really will change-up your game in the kitchen. How to buy this book! Disclosure: Amazon affiliate link. If you choose to purchase from my link, I would earn a commission. Check out this perfect summer recipe from the book (published with permission) below! Printed with permission from Millenial Kosher, Chanie Apfelbaum. Prepare the dressing by placing all dressing ingredients in a food processor or blender and blend until smooth and creamy. 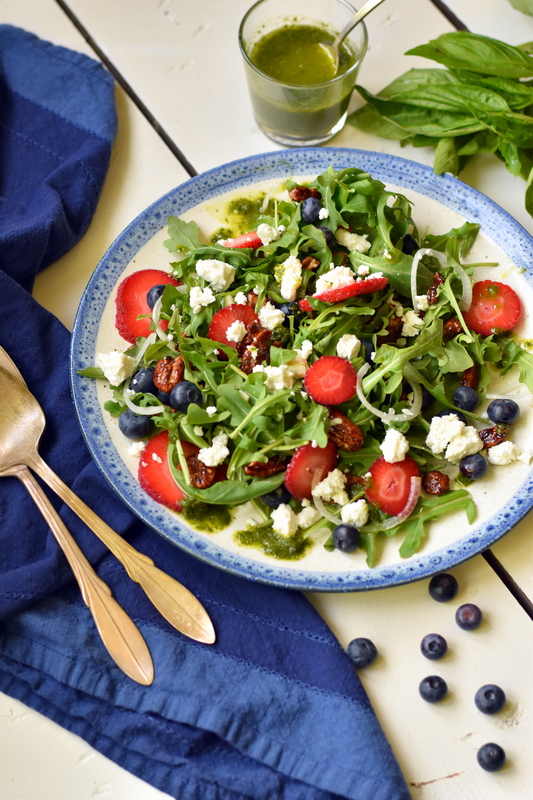 To arrange the salad: spread out frisee or arugala on a platter and top with berries, pecans, red onion and feta. Drizzle with dressing right before serving.